Using the outdoors as a natural background, I created a stylized, edgy image of the groom and groomsmen. Hard lighting and off-camera flash created a central focus on the man of the hour, supported by his guys standing behind him. 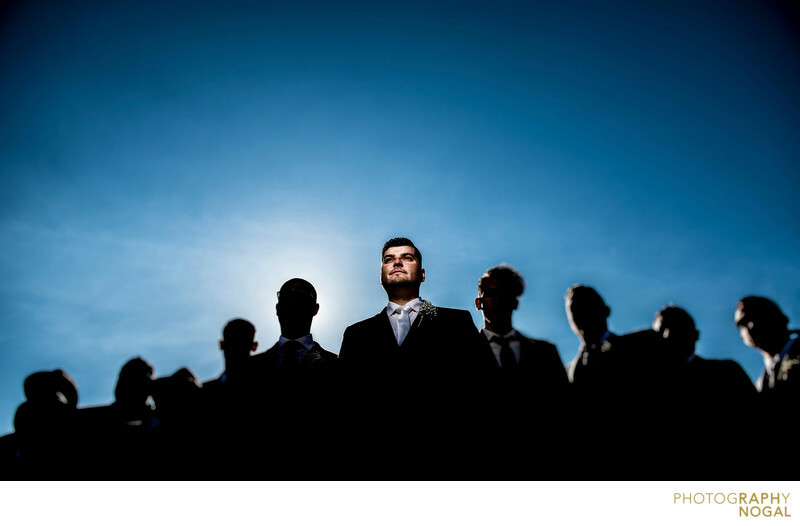 The groomsmen are deliberately kept in silhouette to add another element of creativity and extra focus on the groom. This photo was taken with a Nikon D750 DSLR at ISO 100, f4.5 aperture, 1/2000th shutter speed using High Speed Sync (HSS) with a Nikon Nikkor 24-70mm f2.8 zoom lens, at 24mm focal length. The lighting was a flash on a monopod, held by Oliver. The flash contained the MagMod snoot (MagSnoot) to extremely narrow the beam of light on the groom and restrict it to only hit his face. This photograph won a Fearless Award in 2016 and is also often featured in MagMod's advertising for the snoot (MagSnoot) both in print and online.